This article is about the fact that the Earth is spherical and its history. For the size and shape of the Earth in geodesy, see Figure of the Earth. For the measurement, see Earth's circumference. The earliest reliably documented mention of the spherical Earth concept dates from around the 6th century BC when it appeared in ancient Greek philosophy, but remained a matter of speculation until the 3rd century BC, when Hellenistic astronomy established the spherical shape of the Earth as a physical given and calculated Earth's circumference. The paradigm was gradually adopted throughout the Old World during Late Antiquity and the Middle Ages. A practical demonstration of Earth's sphericity was achieved by Ferdinand Magellan and Juan Sebastián Elcano's expedition's circumnavigation (1519–1522). The concept of a spherical Earth displaced earlier beliefs in a flat Earth: In early Mesopotamian mythology, the world was portrayed as a flat disk floating in the ocean with a hemispherical sky-dome above, and this forms the premise for early world maps like those of Anaximander and Hecataeus of Miletus. Other speculations on the shape of Earth include a seven-layered ziggurat or cosmic mountain, alluded to in the Avesta and ancient Persian writings (see seven climes). The realization that the figure of the Earth is more accurately described as an ellipsoid dates to the 17th century, as described by Isaac Newton in Principia. In the early 19th century, the flattening of the earth ellipsoid was determined to be of the order of 1/300 (Delambre, Everest). The modern value as determined by the US DoD World Geodetic System since the 1960s is close to 1/298.25. The Earth is massive enough that gravity maintains it as a roughly spherical shape. Its formation into a sphere was made easy by its primordial hot, liquid phase. The Solar System formed from a dust cloud that was at least partially the remnant of one or more supernovas that created heavy elements by nucleosynthesis. Grains of matter accreted through electrostatic interaction. As they grew in mass, gravity took over in gathering yet more mass, releasing the potential energy of their collisions and in-falling as heat. The protoplanetary disk also had a greater proportion of radioactive elements than the Earth today because, over time, those elements decayed. Their decay heated the early Earth even further, and continue to contribute to Earth's internal heat budget. The early Earth was thus mostly liquid. A sphere is the only stable shape for a non-rotating, gravitationally self-attracting liquid. The outward acceleration caused by the Earth's rotation is greater at the equator than at the poles (where is it zero), so the sphere gets deformed into an ellipsoid, which represents the shape having the lowest potential energy for a rotating, fluid body. This ellipsoid is slightly fatter around the equator than a perfect sphere would be. Earth's shape is also slightly lumpy because it is composed of different materials of different densities that exert slightly different amounts of gravitational force per volume. The liquidity of a hot, newly formed planet allows heavier elements to sink down to the middle and forces lighter elements closer to the surface, a process known as planetary differentiation. This event is known as the iron catastrophe; the most abundant heavier elements were iron and nickel, which now form the Earth's core. Though the surface rocks of the Earth have cooled enough to solidify, the outer core of the planet is still hot enough to remain liquid. Energy is still being released; volcanic and tectonic activity has pushed rocks into hills and mountains and blown them out of calderas. Meteors also create impact craters and surrounding ridges. However, if the energy release ceases from these processes, then they tend to erode away over time and return toward the lowest potential-energy curve of the ellipsoid. Weather powered by solar energy can also move water, rock, and soil to make the Earth slightly out of round. Earth undulates as the shape of its lowest potential energy changes daily due to the gravity of the Sun and Moon as they move around with respect to the Earth. This is what causes tides in the oceans' water, which can flow freely along the changing potential. The IAU definitions of planet and dwarf planet require that a Sun-orbiting body has undergone the rounding process to reach a roughly spherical shape, an achievement known as hydrostatic equilibrium. The same spheroidal shape can be seen from smaller rocky planets like Mars to gas giants like Jupiter. Any natural Sun-orbiting body that has not reached hydrostatic equilibrium is classified by the IAU as a small Solar System body (SSB). These come in many non-spherical shapes which are lumpy masses accreted haphazardly by in-falling dust and rock; not enough mass falls in to generate the heat needed to complete the rounding. Some SSSBs are just collections of relatively small rocks that are weakly held next to each other by gravity but are not actually fused into a single big bedrock. Some larger SSSBs are nearly round but have not reached hydrostatic equilibrium. The small Solar System body 4 Vesta is large enough to have undergone at least partial planetary differentiation. Stars like the Sun are also spheroidal due to gravity's effects on their plasma, which is a free-flowing fluid. Ongoing stellar fusion is a much greater source of heat for stars compared to the initial heat released during formation. The roughly spherical shape of the Earth can be confirmed by many different types of observation from ground level, aircraft, and spacecraft. The shape causes a number of phenomena that a flat Earth would not. Some of these phenomena and observations would be possible on other shapes, such as a curved disc or torus, but no other shape would explain all of them. Many pictures have been taken of the entire Earth by satellites launched by a variety of governments and private organizations. From high orbits, where half the planet can be seen at once, it is plainly spherical. The only way to piece together all the pictures taken of the ground from lower orbits so that all the surface features line up seamlessly and without distortion is to put them on an approximately spherical surface. Astronauts in low Earth orbit can personally see the curvature of the planet, and travel all the way around several times a day. The astronauts who travelled to the Moon have seen the entire Moon-facing half at once, and can watch the sphere rotate once a day (approximately; the Moon is also moving with respect to the Earth). People in high-flying aircraft or skydiving from high-altitude balloons can plainly see the curvature of the Earth. Commercial aircraft do not necessarily fly high enough to make this obvious. Trying to measure the curvature of the horizon by taking a picture is complicated by the fact that camera lenses can produce distorted images depending on the angle used. An extreme version of this effect can be seen in the fisheye lens. Scientific measurements would require a carefully calibrated lens. The fastest way for an airplane to travel between two distant cities is a great circle route, which deviates significantly from what would be the fastest straight-line travel path on a flat Earth. Photos of the ground taken from airplanes over a large enough area also do not fit seamlessly together on a flat surface, but do fit on a roughly spherical surface. Aerial photographs of large areas must be corrected to account for curvature. On a completely flat Earth with no visual interference (such as trees, hills, or atmospheric haze) the ground itself would never obscure distant objects; one would be able to see all the way to the edge of the surface. A spherical surface has a horizon which is closer when viewed from a lower altitude. In theory, a person standing on the surface with eyes 1.8 metres (5 ft 11 in) above the ground can see the ground up to about 4.79 kilometres (2.98 mi) away, but a person at the top of the Eiffel Tower at 273 metres (896 ft) can see the ground up to about 58.98 kilometres (36.65 mi) away. This phenomenon would seem to present a method to verify that the Earth's surface is locally convex. If the degree of curvature was determined to be the same everywhere on the Earth's surface, and that surface was determined to be large enough, it would show that the Earth is spherical. In practice, this turns out to be an unreliable method of measurement, due to variations in atmospheric refraction. This additional effect can give the impression that the Earth's surface is flat, curved more convexly than it is, or even that it is concave, by bending light travelling near the surface of the Earth (as happened in various trials of the famous Bedford Level experiment). The phenomenon of variable atmospheric bending can be empirically confirmed by noting that sometimes the refractive layers of air can cause the image of a distant object to be broken into pieces or even turned upside down. This is commonly seen at sunset, when the Sun's shape is distorted, but has also been photographed happening for ships, and has caused the city of Chicago to appear normally, upside down, and broken into pieces from across Lake Michigan (from where it is normally below the horizon). When the atmosphere is relatively well-mixed, the visual effects generally expected of a spherical Earth can be observed. For example, ships travelling on large bodies of water (such as the ocean) disappear over the horizon progressively, such that the highest part of the ship can still be seen even when lower parts cannot, proportional to distance from the observer. The same is true of the coastline or mountain when viewed from a ship or from across a large lake or flat terrain. The shadow of the Earth on the Moon during a lunar eclipse is always a dark circle that moves from one side of the Moon to the other (partially grazing it during a partial eclipse). This could be produced by a flat disc that always faces the Moon head-on during the eclipse, but this is inconsistent with the fact that the Moon is only rarely directly overhead during an eclipse. For each eclipse, the local surface of the Earth is pointed in a somewhat different direction. The shadow of a circular disc held at an angle is an oval, not a circle as is seen during the eclipse. The idea of the Earth being a flat disc is also inconsistent with the fact that a given lunar eclipse is only visible from half of the Earth at a time. The only shape that casts a round shadow no matter which direction it is pointed is a sphere, and the ancient Greeks deduced that this must mean the Earth is spherical. On a perfectly spherical Earth, flat terrain or ocean, when viewed from the surface, blocks exactly half the sky - a hemisphere of 180°. Moving away from the surface of the Earth means that the ground blocks less and less of the sky. For example, when viewed from the Moon, the Earth blocks only a small portion of the sky, because it is so distant. This phenomenon of geometry means that when viewed from a high mountain, flat ground or ocean blocks less than 180° of the sky. The rate of change in the angle blocked by the sky as altitude increases is different for a disc than a sphere, and values observed show that the Earth is locally convex. (The angles blocked would also be different for a mountain close to the edge of a flat Earth compared to a mountain in the middle of a flat Earth, and this is not observed.) In theory, measurements of this type from all around the Earth would confirm that it is a complete sphere (as opposed to some other shape with convex areas) though actually taking all those measurements would be very expensive. Using other evidence to hypothesize a spherical shape, the medieval Iranian scholar Al-Biruni used this phenomenon to calculate the Earth's circumference to within 16.8 kilometres (10.4 mi) of the correct value. The fixed stars can be demonstrated to be very far away, by diurnal parallax measurements (a technique known at least as early as Ancient Greece). Unlike the Sun, Moon, and planets, they do not change position with respect to one another (at least not perceptibly over the span of a human lifetime); the shapes of the constellations are always the same. This makes them a convenient reference background for determining the shape of the Earth. Adding distance measurements on the ground allows calculation of the Earth's size. The fact that different stars are visible from different locations on the Earth was noticed in ancient times. Aristotle wrote that some stars are visible from Egypt which are not visible from Europe. This would not be possible if the Earth was flat. At the South Pole, a completely non-overlapping set of constellations are visible during the six months of continuous nighttime, including Orion, Crux, and Centaurus. This 180° hemisphere of stars rotate clockwise once every 24 hours, around a point directly overhead (where there do not happen to be any particularly bright stars). The fact that the stars visible from the north and south poles do not overlap must mean that the two observation spots are on opposite sides of the Earth, which is not possible if the Earth is a single-sided disc, but is possible for other shapes (like a sphere, but also any other convex shape like a donut or dumbbell). From any point on the equator, 360° of stars are visible over the course of the night, as the sky rotates around a line drawn from due north to due south (which could be defined as "the directions to walk to get to the poles in the shortest amount of time"). When facing east, the stars visible from the north pole are on the left, and the stars visible from the south pole are on the right. This means the equator must be facing at a 90° angle from the poles. The direction any intermediate spot on the Earth is facing can also be calculated by measuring the angles of the fixed stars and determining how much of the sky is visible. For example, New York City is about 40° north of the equator. The apparent motion of the Sun blots out slightly different parts of the sky from day to day, but over the course of the entire year it sees a dome of 280° (360° - 80°). So for example, both Orion and the Big Dipper are visible during at least part of the year. Making stellar observations from a representative set of points across the Earth, combined with knowing the shortest on-the-ground distance between any two given points makes an approximate sphere the only possible shape for the Earth. Knowing the difference in angle between two points on the Earth's surface and the surface distance between them allows a calculation of the Earth's size. Using observations at Rhodes (in Greece) and Alexandria (in Egypt) and the distance between them, the Ancient Greek philosopher Posidonius actually did use this technique to calculate the circumference of the planet to within perhaps 4% of the correct value (though modern equivalents of his units of measure are not precisely known). Some flat Earth theories that propose the world is a north-pole-centered disc, conceive of Antarctica as an impenetrable ice wall that encircles the planet and hides any edges. This disc model explains east-west circumnavigation as simply moving around the disc in a circle. (East-west paths form a circle in both disc and spherical geometry.) It is possible in this model to traverse the North Pole, but it is not possible to perform a circumnavigation that includes the South Pole (which it posits does not exist). Explorers, government researchers, commercial pilots, and tourists have been to Antarctica and found that it is not a large ring that encircles the entire world, but actually a roughly disc-shaped continent smaller than South America but larger than Australia, with an interior that can in fact be traversed in order to take a shorter path from e.g. the tip of South America to Australia than would be possible on a disc. The first land crossing of the entirety of Antarctica was the Commonwealth Trans-Antarctic Expedition in 1955-1958, and many exploratory airplanes have since passed over the continent in various directions. On a flat Earth, an omnidirectional Sun (emitting light in all directions, as it does) would illuminate the entire surface at the same time, and all places would experience sunrise and sunset at the horizon at the same time (with some small variations due to mountains and valleys). With a spherical Earth, half the planet is in daylight at any given time (the hemisphere facing the Sun) and the other half is experiencing nighttime. When a given location on the spherical Earth is in sunlight, its antipode - the location exactly on the opposite side of the Earth - is always experiencing nighttime. The spherical shape of the Earth causes the Sun to rise and set at different times in different places, and different locations get different amounts of sunlight each day. In order to explain day and night, time zones, and the seasons, some flat Earth theorists propose that the Sun does not emit light in all directions, but acts more like a spotlight, only illuminating part of the flat Earth at a time. This theory is not consistent with observation; at sunrise and sunset, a spotlight Sun would be up in the sky at least a little bit, rather than at the horizon where it is always actually observed. A spotlight Sun would also appear at different angles in the sky with respect to a flat ground than it does with respect to a curved ground. Assuming light travels in straight lines, actual measurements of the Sun's angle in the sky from locations very distant from each other are only consistent with a geometry where the Sun is very far away and is being seen from a hemispherical surface (the daylight half of the Earth). These two phenomena are related: a low-altitude spotlight Sun would spend most of the day near the horizon for most locations on Earth (which is not observed), but rise and set fairly close to the horizon. A high-altitude Sun would spend more of the day away from the horizon, but rise and set fairly far from the horizon (which is not observed). Ancient timekeeping reckoned "noon" as the time of day when the Sun is highest in the sky, with the rest of the hours in the day measured against that. During the day, the apparent solar time can be measured directly with a sundial. In ancient Egypt, the first known sundials divided the day into 12 hours, though because the length of the day changed with the season, the length of the hours also changed. Sundials that defined hours as always being the same duration appeared in the Renaissance. In Western Europe, clock towers and striking clocks were used in the Middle Ages to keep people nearby appraised of the local time, though compared to modern times this was less important in a largely agrarian society. Because the Sun reaches its highest point at different times for different longitudes (about four minutes of time for every degree of longitude difference east or west), the local solar noon in each city is different except for those directly north or south of each other. This means that the clocks in different cities could be offset from each other by minutes or hours. As clocks became more precise and industrialization made timekeeping more important, cities switched to mean solar time, which ignores minor variations in the timing of local solar noon over the year, due to the elliptical nature of the Earth's orbit, and its tilt. The differences in clock time between cities was not generally a problem until the advent of railroad travel in the 1800s, which both made travel between distant cities much faster than by walking or horse, and also required passengers to show up at specific times to meet their desired trains. In the United Kingdom, railroads gradually switched to Greenwich Mean Time (set from local time at the Greenwich observatory in London), followed by public clocks across the country generally, forming a single time zone. In the United States, railroads published schedules based on local time, then later based on standard time for that railroad (typically the local time at the railroad's headquarters), and then finally based on four standard time zones shared across all railroads, where neighboring zones differed by exactly one hour. At first railroad time was synchronized by portable chronometers, and then later by telegraph and radio signals. San Francisco is at 122.41°W longitude and Richmond, Virginia is at 77.46°W longitude. They are both at about 37.6°N latitude (±.2°). The approximately 45° of longitude difference translates into about 180 minutes, or 3 hours, of time between sunsets in the two cities, for example. San Francisco is in the Pacific Time zone, and Richmond is in the Eastern Time zone, which are three hours apart, so the local clocks in each city show that the Sun sets at about the same time when using the local time zone. But a phone call from Richmond to San Francisco at sunset will reveal that there are still three hours of daylight left in California. On a flat Earth with an omnidirectional Sun, all places would experience the same amount of daylight every day, and all places would get daylight at the same time. Actual day length varies considerably, with places closer to the poles getting very long days in the summer and very short days in the winter, with northerly summer happening at the same time as southerly winter. Places north of the Arctic Circle and south of the Antarctic Circle get no sunlight for at least one day a year, and get 24-hour sunlight for at least one day a year. Both the poles experience sunlight for 6 months and darkness for 6 months, at opposite times. The movement of daylight between the northern and southern hemispheres happens because of the axial tilt of the Earth. The imaginary line around which the Earth spins, which goes between the North Pole and South Pole, is tilted about 23° from the oval that describes its orbit around the Sun. The Earth always points in the same direction as it moves around the Sun, so for half the year (summer in the Northern Hemisphere), the North Pole is pointed slightly toward the Sun, keeping it in daylight all the time because the Sun lights up the half of the Earth that is facing it (and the North Pole is always in that half due to the tilt). For the other half of the orbit, the South Pole is tilted slightly toward the Sun, and it is winter in the Northern Hemisphere. This means that at the equator, the Sun is not directly overhead at noon, except around the autumnal equinox and vernal equinox, when one spot on the equator is pointed directly at the Sun. The length of the day varies because as the Earth rotates some places (near the poles) pass through only a short curve near the top or bottom of the sunlight half; other places (near the equator) travel along much longer curves through the middle. The length of twilight would be very different on a flat Earth. On a round Earth, the atmosphere above the ground is lit for a while before sunrise and after sunset are observed at ground level, because the Sun is still visible from higher altitudes. Longer twilights are observed at higher latitudes (near the poles) due to a shallower angle of the Sun's apparent movement compared to the horizon. On a flat Earth, the Sun's shadow would reach the upper atmosphere very quickly, except near the closest edge of the Earth, and would always set at the same angle to the ground (which is not what is observed). The "spotlight Sun" theory is also not consistent with this observation, since the air cannot be lit without the ground below it also being lit (except for shadows of mountains and other surface obstacles). On a given day, if many different cities measure the angle of the Sun at local noon, the resulting data, when combined with the known distances between cities, shows that the Earth has 180 degrees of north-south curvature. (A full range of angles will be observed if the north and south poles are included, and the day chosen is either the autumnal or spring equinox.) This is consistent with many rounded shapes, including a sphere, and is inconsistent with a flat shape. Some claim that this experiment assumes a very distant Sun, such that the incoming rays are essentially parallel, and if a flat Earth is assumed, that the measured angles can allow one to calculate the distance to the Sun, which must be small enough that its incoming rays are not very parallel. However, if more than two relatively well-separated cities are included in the experiment, the calculation will make clear whether the Sun is distant or nearby. For example, on the equinox, the 0 degree angle from the North Pole and the 90 degree angle from the equator predict a Sun which would have to be located essentially next to the surface of a flat Earth, but the difference in angle between the equator and New York City would predict a Sun much further away if the Earth is flat. Because these results are contradictory, the surface of the Earth cannot be flat; the data is consistent with a nearly spherical Earth and a Sun which is very far away compared with the diameter of the Earth. Using the knowledge that the Sun is very far away, the ancient Greek geographer Eratosthenes performed an experiment using the differences in the observed angle of the Sun from two different locations to calculate the circumference of the Earth. Though modern telecommunications and timekeeping were not available, he was able to make sure the measurements happened at the same time by having them taken when the Sun was highest in the sky (local noon) at both locations. Using slightly inaccurate assumptions about the locations of two cities, he came to a result within 15% of the correct value. On level ground, the difference in the distance to the horizon between lying down and standing up is large enough to watch the Sun set twice by quickly standing up immediately after seeing it set for the first time while lying down. This also can be done with a cherry picker or a tall building with a fast elevator. On a flat Earth, one would not be able to see the Sun again (unless standing near the edge closest to the Sun) due to a much faster-moving Sun shadow. When the supersonic Concorde took off not long after sunset from London and flew westward to New York faster than the sunset was advancing westward on the ground, passengers observed a sunrise in the west. After landing in New York, passengers saw a second sunset in the west. Because the speed of the Sun's shadow is slower in polar regions (due to the steeper angle), even a subsonic aircraft can overtake the sunset when flying at high latitudes. One photographer used a roughly circular route around the North Pole to take pictures of 24 sunsets in the same 24-hour period, pausing westward progress in each time zone to let the shadow of the Sun catch up. The surface of the Earth rotates at 180.17 miles per hour (289.96 km/h) at 80° north or south, and 1,040.4 miles per hour (1,674.4 km/h) at the equator. Because the Earth is spherical, long-distance travel sometimes requires heading in different directions than one would head on a flat Earth. For example, consider an airplane that travels 10,000 kilometres (6,200 mi) in a straight line, takes a 90-degree right turn, travels another 10,000 kilometres (6,200 mi), takes another 90-degree right turn, and travels 10,000 kilometres (6,200 mi) a third time. On a flat Earth, the aircraft would have travelled along three sides of a square, and arrive at a spot about 10,000 kilometres (6,200 mi) from where it started. But because the Earth is spherical, in reality it will have travelled along three sides of a triangle, and arrive back very close to its starting point. If the starting point is the North Pole, it would have travelled due south from the North Pole to the equator, then west for a quarter of the way around the Earth, and then due north back to the North Pole. In spherical geometry, the sum of angles inside a triangle is greater than 180° (in this example 270°, having arrived back at the north pole a 90° angle to the departure path) unlike on a flat surface, where it is always exactly 180°. A meridian of longitude is a line where local solar noon occurs at the same time each day. These lines define "north" and "south". These are perpendicular to lines of latitude that define "east" and "west", where the Sun is at the same angle at local noon on the same day. If the Sun were travelling from east to west over a flat Earth, meridian lines would always be the same distance apart - they would form a square grid when combined with lines of latitude. In reality, meridian lines get farther apart as one travels toward the equator, which is only possible on a round Earth. In places where land is plotted on a grid system, this causes discontinuities in the grid. For example, in areas of the Midwestern United States that use the Public Land Survey System, the northernmost and westernmost sections of a township deviate from what would otherwise be an exact square mile. The resulting discontinuities are sometimes reflected directly in local roads, which have kinks where the grid cannot follow completely straight lines. Low-pressure weather systems with inward winds (such as a hurricane) spin counterclockwise north of the equator, but clockwise south of the equator. This is due to the Coriolis force, and requires that (assuming they are attached to each other and rotating in the same direction) the north and southern halves of the Earth are angled in opposite directions (e.g. the north is facing toward Polaris and the south is facing away from it). The laws of gravity, chemistry, and physics that explain the formation and rounding of the Earth are well-tested through experiment, and applied successfully to many engineering tasks. From these laws, we know the amount of mass the Earth contains, and that a non-spherical planet the size of the Earth would not be able to support itself against its own gravity. A flat disc the size of the Earth, for example, would likely crack, heat up, liquefy, and re-form into a roughly spherical shape. On a disc strong enough to maintain its shape, gravity would not pull downward with respect to the surface, but would pull toward the center of the disc, contrary to what is observed on level terrain (and which would create major problems with oceans flowing toward the center of the disk). Ignoring the other concerns, some flat Earth theorists explain the observed surface "gravity" by proposing that the flat Earth is constantly accelerating upwards. Such a theory would also leave open for explanation the tides seen in Earth's oceans, which are conventionally explained by the gravity exerted by the Sun and Moon. Observation of Foucault pendulums, popular in science museums around the world, demonstrate both that the world is spherical and that it rotates (not that the stars are rotating around it). The mathematics of navigation by GPS assume that satellites are moving in known orbits around an approximately spherical surface. The accuracy of GPS navigation in determining latitude and longitude and the way these numbers map onto locations on the ground show that these assumptions are correct. The same is true for the operational GLONASS system run by Russia, and the in-development European Galileo, Chinese BeiDou, and Indian IRNSS. Radio transmitters are mounted on tall towers because they generally rely on line-of-sight propagation. The distance to the horizon is further at higher altitude, so mounting them higher significantly increases the area they can serve. Some signals can be transmitted at much longer distances, but only if they are at frequencies where they can use groundwave propagation, tropospheric propagation, tropospheric scatter, or ionospheric propagation to reflect or refract signals around the curve of the Earth. The design of some large structures needs to take the shape of the Earth into account. For example, the towers of the Humber Bridge, although both vertical with respect to gravity, are 36 mm (1.4 inches) farther apart at the top than the bottom due to the local curvature. The Hebrew Bible imagined a three-part world, with the heavens (shamayim) above, Earth (eres) in the middle, and the underworld (sheol) below. After the 4th century BC this was gradually replaced by a Greek scientific cosmology of a spherical Earth surrounded by multiple concentric heavens. Though the earliest written mention of a spherical Earth comes from ancient Greek sources, there is no account of how the sphericity of the Earth was discovered. A plausible explanation is that it was "the experience of travellers that suggested such an explanation for the variation in the observable altitude of the pole and the change in the area of circumpolar stars, a change that was quite drastic between Greek settlements" around the eastern Mediterranean Sea, particularly those between the Nile Delta and Crimea. In The Histories, written 431–425 BC, Herodotus casted doubt on a report of the Sun observed shining from the north. He stated that the phenomenon was observed during a circumnavigation of Africa undertaken by Phoenician explorers employed by Egyptian pharaoh Necho II c. 610–595 BC (The Histories, 4.42) who claimed to have had the Sun on their right when circumnavigating in a clockwise direction. To modern historians, these details confirm the truth of the Phoenicians' report and even open the possibility that the Phoenicians knew about the spherical model. However, nothing certain about their knowledge of geography and navigation has survived. Early Greek philosophers alluded to a spherical Earth, though with some ambiguity. Pythagoras (6th century BC) was among those said to have originated the idea, but this might reflect the ancient Greek practice of ascribing every discovery to one or another of their ancient wise men. Some idea of the sphericity of the Earth seems to have been known to both Parmenides and Empedocles in the 5th century BC, and although the idea cannot reliably be ascribed to Pythagoras, it might nevertheless have been formulated in the Pythagorean school in the 5th century BC although some disagree. After the 5th century BC, no Greek writer of repute thought the world was anything but round. Plato (427–347 BC) travelled to southern Italy to study Pythagorean mathematics. When he returned to Athens and established his school, Plato also taught his students that Earth was a sphere, though he offered no justifications. "My conviction is that the Earth is a round body in the centre of the heavens, and therefore has no need of air or of any similar force to be a support". If man could soar high above the clouds, Earth would resemble "one of those balls which have leather coverings in twelve pieces, and is decked with various colours, of which the colours used by painters on Earth are in a manner samples." In Timaeus, his one work that was available throughout the Middle Ages in Latin, we read that the Creator "made the world in the form of a globe, round as from a lathe, having its extremes in every direction equidistant from the centre, the most perfect and the most like itself of all figures", though the word "world" here refers to the heavens. The shadow of Earth on the Moon during a lunar eclipse is round. (De caelo, 297b31–298a10). The concepts of symmetry, equilibrium and cyclic repetition permeated Aristotle's work. In his Meteorology he divided the world into five climatic zones: two temperate areas separated by a torrid zone near the equator, and two cold inhospitable regions, "one near our upper or northern pole and the other near the ... southern pole," both impenetrable and girdled with ice (Meteorologica, 362a31–35). Although no humans could survive in the frigid zones, inhabitants in the southern temperate regions could exist. Aristotle's theory of natural place relied on a spherical Earth to explain why heavy things go down (toward what Aristotle believed was the center of the Universe), and things like air and fire go up. In this geocentric model, the structure of the universe was believed to be a series of perfect spheres. The Sun, Moon, planets and fixed stars were believed to move on celestial spheres around a stationary Earth. Though Aristotle's theory of physics survived in the Christian world for many centuries, the heliocentric model was eventually shown to be a more correct explanation of the Solar System than the geocentric model, and atomic theory was shown to be a more correct explanation of the nature of matter than classical elements like earth, water, air, fire, and aether. In proposition 2 of the First Book of his treatise "On floating bodies," Archimedes demonstrates that "The surface of any fluid at rest is the surface of a sphere whose centre is the same as that of the Earth". Subsequently, in propositions 8 and 9 of the same work, he assumes the result of proposition 2 that the Earth is a sphere and that the surface of a fluid on it is a sphere centered on the center of the Earth. Eratosthenes, a Greek astronomer from Hellenistic Cyrenaica (276–194 BC), estimated Earth's circumference around 240 BC. He had heard that in Syene the Sun was directly overhead at the summer solstice whereas in Alexandria it still cast a shadow. Using the differing angles the shadows made as the basis of his trigonometric calculations he estimated a circumference of around 250,000 stades. The length that Eratosthenes intended for a 'stade' is not known, but his figure only has an error of around five to fifteen percent. Eratosthenes used rough estimates and round numbers, but depending on the length of the stadion, his result is within a margin of between 2% and 20% of the actual meridional circumference, 40,008 kilometres (24,860 mi). Note that Eratosthenes could only measure the circumference of the Earth by assuming that the distance to the Sun is so great that the rays of sunlight are practically parallel. Seventeen hundred years after Eratosthenes, Christopher Columbus studied Eratosthenes's findings before sailing west for the Indies. However, ultimately he rejected Eratosthenes in favour of other maps and arguments that interpreted Earth's circumference to be a third smaller than reality. If, instead, Columbus had accepted Eratosthenes findings, then he may have never gone west, since he didn't have the supplies or funding needed for the much longer voyage. Seleucus of Seleucia (c. 190 BC), who lived in the city of Seleucia in Mesopotamia, wrote that the Earth is spherical (and actually orbits the Sun, influenced by the heliocentric theory of Aristarchus of Samos). Posidonius (c. 135 – 51 BC) put faith in Eratosthenes's method, though by observing the star Canopus, rather than the Sun in establishing the Earth's circumference. In Ptolemy's Geographia, his result was favoured over that of Eratosthenes. Posidonius furthermore expressed the distance of the Sun in Earth radii. From its Greek origins, the idea of a spherical Earth, along with much of Greek astronomical thought, slowly spread across the globe and ultimately became the adopted view in all major astronomical traditions. In the West, the idea came to the Romans through the lengthy process of cross-fertilization with Hellenistic civilization. Many Roman authors such as Cicero and Pliny refer in their works to the rotundity of the Earth as a matter of course. Pliny also considered the possibility of an imperfect sphere "shaped like a pinecone". When a ship is at the horizon, its lower part is obscured by the Earth's curvature. This was one of the first arguments favouring a round-Earth model. It has been suggested that seafarers probably provided the first observational evidence that the Earth was not flat, based on observations of the horizon. This argument was put forward by the geographer Strabo (c. 64 BC – 24 AD), who suggested that the spherical shape of the Earth was probably known to seafarers around the Mediterranean Sea since at least the time of Homer, citing a line from the Odyssey as indicating that the poet Homer knew of this as early as the 7th or 8th century BC. Strabo cited various phenomena observed at sea as suggesting that the Earth was spherical. He observed that elevated lights or areas of land were visible to sailors at greater distances than those less elevated, and stated that the curvature of the sea was obviously responsible for this. Claudius Ptolemy (90–168 AD) lived in Alexandria, the centre of scholarship in the 2nd century. In the Almagest, which remained the standard work of astronomy for 1,400 years, he advanced many arguments for the spherical nature of the Earth. Among them was the observation that when a ship is sailing towards mountains, observers note these seem to rise from the sea, indicating that they were hidden by the curved surface of the sea. He also gives separate arguments that the Earth is curved north-south and that it is curved east-west. He compiled an eight-volume Geographia covering what was known about the Earth. The first part of the Geographia is a discussion of the data and of the methods he used. As with the model of the Solar System in the Almagest, Ptolemy put all this information into a grand scheme. He assigned coordinates to all the places and geographic features he knew, in a grid that spanned the globe (although most of this has been lost). Latitude was measured from the equator, as it is today, but Ptolemy preferred to express it as the length of the longest day rather than degrees of arc (the length of the midsummer day increases from 12h to 24h as you go from the equator to the polar circle). He put the meridian of 0 longitude at the most western land he knew, the Canary Islands. Geographia indicated the countries of "Serica" and "Sinae" (China) at the extreme right, beyond the island of "Taprobane" (Sri Lanka, oversized) and the "Aurea Chersonesus" (Southeast Asian peninsula). Ptolemy also devised and provided instructions on how to create maps both of the whole inhabited world (oikoumenè) and of the Roman provinces. In the second part of the Geographia, he provided the necessary topographic lists, and captions for the maps. His oikoumenè spanned 180 degrees of longitude from the Canary Islands in the Atlantic Ocean to China, and about 81 degrees of latitude from the Arctic to the East Indies and deep into Africa. Ptolemy was well aware that he knew about only a quarter of the globe. Knowledge of the spherical shape of the Earth was received in scholarship of Late Antiquity as a matter of course, in both Neoplatonism and Early Christianity. Calcidius's fourth-century Latin commentary on and translation of Plato's Timaeus, which was one of the few examples of Greek scientific thought that was known in the Early Middle Ages in Western Europe, discussed Hipparchus's use of the geometrical circumstances of eclipses to compute the relative diameters of the Sun, Earth, and Moon. Theological doubt informed by the flat Earth model implied in the Hebrew Bible inspired some early Christian scholars such as Lactantius, John Chrysostom and Athanasius of Alexandria, but this remained an eccentric current. Learned Christian authors such as Basil of Caesarea, Ambrose and Augustine of Hippo were clearly aware of the sphericity of the Earth. "Flat Earthism" lingered longest in Syriac Christianity, which tradition laid greater importance on a literalist interpretation of the Old Testament. Authors from that tradition, such as Cosmas Indicopleustes, presented the Earth as flat as late as in the 6th century. This last remnant of the ancient model of the cosmos disappeared during the 7th century. From the 8th century and the beginning medieval period, "no cosmographer worthy of note has called into question the sphericity of the Earth." While the textual evidence has not survived, the precision of the constants used in pre-Greek Vedanga models, and the model's accuracy in predicting the Moon and Sun's motion for Vedic rituals, probably came from direct astronomical observations. The cosmographic theories and assumptions in ancient India likely developed independently and in parallel, but these were influenced by some unknown quantitative Greek astronomy text in the medieval era. Greek ethnographer Megasthenes, c. 300 BC, has been interpreted as stating that the contemporary Brahmans believed in a spherical Earth as the center of the universe. With the spread of Greek culture in the east, Hellenistic astronomy filtered eastwards to ancient India where its profound influence became apparent in the early centuries AD. The Greek concept of an Earth surrounded by the spheres of the planets and that of the fixed stars, vehemently supported by astronomers like Varahamihir and Brahmagupta, strengthened the astronomical principles. Some ideas were found possible to preserve, although in altered form. The works of the classical Indian astronomer and mathematician, Aryabhatta (476–550 AD), deal with the sphericity of the Earth and the motion of the planets. The final two parts of his Sanskrit magnum opus, the Aryabhatiya, which were named the Kalakriya ("reckoning of time") and the Gol ("sphere"), state that the Earth is spherical and that its circumference is 4,967 yojanas. In modern units this is 39,968 km (24,835 mi), close to the current equatorial value of 40,075 km (24,901 mi). Knowledge of the sphericity of the Earth survived into the medieval corpus of knowledge by direct transmission of the texts of Greek antiquity (Aristotle), and via authors such as Isidore of Seville and Beda Venerabilis. It became increasingly traceable with the rise of scholasticism and medieval learning. Spread of this knowledge beyond the immediate sphere of Greco-Roman scholarship was necessarily gradual, associated with the pace of Christianisation of Europe. For example, the first evidence of knowledge of the spherical shape of the Earth in Scandinavia is a 12th-century Old Icelandic translation of Elucidarius. A non-exhaustive list of more than a hundred Latin and vernacular writers from Late Antiquity and the Middle Ages who were aware that the earth was spherical has been compiled by Reinhard Krüger, professor for Romance literature at the University of Stuttgart. Bishop Isidore of Seville (560–636) taught in his widely read encyclopedia, The Etymologies, that the Earth was "round". The bishop's confusing exposition and choice of imprecise Latin terms have divided scholarly opinion on whether he meant a sphere or a disk or even whether he meant anything specific. Notable recent scholars claim that he taught a spherical Earth. Isidore did not admit the possibility of people dwelling at the antipodes, considering them as legendary and noting that there was no evidence for their existence. The monk Bede (c. 672–735) wrote in his influential treatise on computus, The Reckoning of Time, that the Earth was round. He explained the unequal length of daylight from "the roundness of the Earth, for not without reason is it called 'the orb of the world' on the pages of Holy Scripture and of ordinary literature. It is, in fact, set like a sphere in the middle of the whole universe." (De temporum ratione, 32). The large number of surviving manuscripts of The Reckoning of Time, copied to meet the Carolingian requirement that all priests should study the computus, indicates that many, if not most, priests were exposed to the idea of the sphericity of the Earth. Ælfric of Eynsham paraphrased Bede into Old English, saying, "Now the Earth's roundness and the Sun's orbit constitute the obstacle to the day's being equally long in every land." Bede was lucid about Earth's sphericity, writing "We call the earth a globe, not as if the shape of a sphere were expressed in the diversity of plains and mountains, but because, if all things are included in the outline, the earth's circumference will represent the figure of a perfect globe... For truly it is an orb placed in the centre of the universe; in its width it is like a circle, and not circular like a shield but rather like a ball, and it extends from its centre with perfect roundness on all sides." The 7th-century Armenian scholar Anania Shirakatsi described the world as "being like an egg with a spherical yolk (the globe) surrounded by a layer of white (the atmosphere) and covered with a hard shell (the sky)." Islamic astronomy was developed on the basis of a spherical earth inherited from Hellenistic astronomy. The Islamic theoretical framework largely relied on the fundamental contributions of Aristotle (De caelo) and Ptolemy (Almagest), both of whom worked from the premise that the Earth was spherical and at the centre of the universe (geocentric model). Early Islamic scholars recognized Earth's sphericity, leading Muslim mathematicians to develop spherical trigonometry in order to further mensuration and to calculate the distance and direction from any given point on the Earth to Mecca. This determined the Qibla, or Muslim direction of prayer. Around 830 AD, Caliph al-Ma'mun commissioned a group of Muslim astronomers and geographers to measure the distance from Tadmur (Palmyra) to Raqqa in modern Syria. They found the cities to be separated by one degree of latitude and the meridian arc distance between them to be 66​2⁄3 miles and thus calculated the Earth's circumference to be 24,000 miles. Another estimate given by his astronomers was 56​2⁄3 Arabic miles (111.8 km) per degree, which corresponds to a circumference of 40,248 km, very close to the currently modern values of 111.3 km per degree and 40,068 km circumference, respectively. Andalusian polymath Ibn Hazm stated that the proof of the Earth's sphericity "is that the Sun is always vertical to a particular spot on Earth". Al-Farghānī (Latinized as Alfraganus) was a Persian astronomer of the 9th century involved in measuring the diameter of the Earth, and commissioned by Al-Ma'mun. His estimate given above for a degree (56​2⁄3 Arabic miles) was much more accurate than the 60​2⁄3 Roman miles (89.7 km) given by Ptolemy. Christopher Columbus uncritically used Alfraganus's figure as if it were in Roman miles instead of in Arabic miles, in order to prove a smaller size of the Earth than that propounded by Ptolemy. Abu Rayhan Biruni (973–1048) used a new method to accurately compute the Earth's circumference, by which he arrived at a value that was close to modern values for the Earth's circumference. His estimate of 6,339.6 km for the Earth radius was only 31.4 km less than the modern mean value of 6,371.0 km. In contrast to his predecessors, who measured the Earth's circumference by sighting the Sun simultaneously from two different locations, Biruni developed a new method of using trigonometric calculations based on the angle between a plain and mountain top. This yielded more accurate measurements of the Earth's circumference and made it possible for a single person to measure it from a single location. Biruni's method was intended to avoid "walking across hot, dusty deserts," and the idea came to him when he was on top of a tall mountain in India. From the top of the mountain, he sighted the angle to the horizon which, along with the mountain's height (which he calculated beforehand), allowed him to calculate the curvature of the Earth. He also made use of algebra to formulate trigonometric equations and used the astrolabe to measure angles. Important contributions to geodesy and geography were also made by Biruni. He introduced techniques to measure the earth and distances on it using triangulation. He found the radius of the earth to be 6339.6 km, a value not obtained in the West until the 16th century. His Masudic canon contains a table giving the coordinates of six hundred places, almost all of which he had direct knowledge. Muslim scholars who held to the round Earth theory used it for a quintessentially Islamic purpose: to calculate the distance and direction from any given point on the Earth to Mecca. This determined the Qibla, or Muslim direction of prayer. A terrestrial globe (Kura-i-ard) was among the presents sent by the Persian Muslim astronomer Jamal-al-Din to Kublai Khan's Chinese court in 1267. It was made of wood on which "seven parts of water are represented in green, three parts of land in white, with rivers, lakes etc." Ho Peng Yoke remarks that "it did not seem to have any general appeal to the Chinese in those days". During the High Middle Ages, the astronomical knowledge in Christian Europe was extended beyond what was transmitted directly from ancient authors by transmission of learning from Medieval Islamic astronomy. An early student of such learning was Gerbert d'Aurillac, the later Pope Sylvester II. 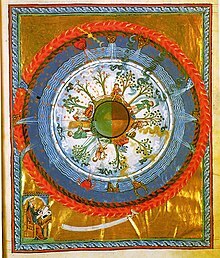 Saint Hildegard (Hildegard von Bingen, 1098–1179), depicted the spherical Earth several times in her work Liber Divinorum Operum. Johannes de Sacrobosco (c. 1195 – c. 1256 AD) wrote a famous work on Astronomy called Tractatus de Sphaera, based on Ptolemy, which primarily considers the sphere of the sky. However, it contains clear proofs of the Earth's sphericity in the first chapter. Many scholastic commentators on Aristotle's On the Heavens and Sacrobosco's Treatise on the Sphere unanimously agreed that the Earth is spherical or round. Grant observes that no author who had studied at a medieval university thought that the Earth was flat. The Elucidarium of Honorius Augustodunensis (c. 1120), an important manual for the instruction of lesser clergy, which was translated into Middle English, Old French, Middle High German, Old Russian, Middle Dutch, Old Norse, Icelandic, Spanish, and several Italian dialects, explicitly refers to a spherical Earth. 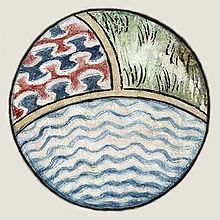 Likewise, the fact that Bertold von Regensburg (mid-13th century) used the spherical Earth as an illustration in a sermon shows that he could assume this knowledge among his congregation. The sermon was preached in the vernacular German, and thus was not intended for a learned audience. Dante's Divine Comedy, written in Italian in the early 14th century, portrays Earth as a sphere, discussing implications such as the different stars visible in the southern hemisphere, the altered position of the Sun, and the various timezones of the Earth. The Portuguese exploration of Africa and Asia, Columbus's voyage to the Americas (1492) and, finally, Ferdinand Magellan's circumnavigation of the Earth (1519–21) provided practical evidence of the global shape of the Earth. The first direct demonstration of Earth's sphericity came in the form of the first circumnavigation in history, an expedition captained by Portuguese explorer Ferdinand Magellan. The expedition was financed by the Spanish Crown. On August 10, 1519, the five ships under Magellan's command departed from Seville. They crossed the Atlantic Ocean, passed through what is now called the Strait of Magellan, crossed the Pacific, and arrived in Cebu, where Magellan was killed by Philippine natives in a battle. His second in command, the Spaniard Juan Sebastián Elcano, continued the expedition and, on September 6, 1522, arrived at Seville, completing the circumnavigation. Charles I of Spain, in recognition of his feat, gave Elcano a coat of arms with the motto Primus circumdedisti me (in Latin, "You went around me first"). A circumnavigation alone does not prove that the Earth is spherical. It could be cylindric or irregularly globular or one of many other shapes. Still, combined with trigonometric evidence of the form used by Eratosthenes 1,700 years prior, the Magellan expedition removed any reasonable doubt in educated circles in Europe. The Transglobe Expedition (1979–1982) was the first expedition to make a circumpolar circumnavigation, traveling the world "vertically" traversing both of the poles of rotation using only surface transport. In the 17th century, the idea of a spherical Earth, now considerably advanced by Western astronomy, ultimately spread to Ming China, when Jesuit missionaries, who held high positions as astronomers at the imperial court, successfully challenged the Chinese belief that the Earth was flat and square. The Ge zhi cao (格致草) treatise of Xiong Mingyu (熊明遇) published in 1648 showed a printed picture of the Earth as a spherical globe, with the text stating that "the round Earth certainly has no square corners". The text also pointed out that sailing ships could return to their port of origin after circumnavigating the waters of the Earth. European astronomy was so much judged worth consideration that numerous Chinese authors developed the idea that the Chinese of antiquity had anticipated most of the novelties presented by the missionaries as European discoveries, for example, the rotundity of the Earth and the "heavenly spherical star carrier model." Making skillful use of philology, these authors cleverly reinterpreted the greatest technical and literary works of Chinese antiquity. From this sprang a new science wholly dedicated to the demonstration of the Chinese origin of astronomy and more generally of all European science and technology. Although mainstream Chinese science until the 17th century held the view that the Earth was flat, square, and enveloped by the celestial sphere, this idea was criticized by the Jin-dynasty scholar Yu Xi (fl. 307–345), who suggested that the Earth could be either square or round, in accordance with the shape of the heavens. The Yuan-dynasty mathematician Li Ye (c. 1192–1279) firmly argued that the Earth was spherical, just like the shape of the heavens only smaller, since a square Earth would hinder the movement of the heavens and celestial bodies in his estimation. The 17th-century Ge zhi cao treatise also used the same terminology to describe the shape of the Earth that the Eastern-Han scholar Zhang Heng (78–139 AD) had used to describe the shape of the Sun and Moon (i.e. that the former was as round as a crossbow bullet, and the latter was the shape of a ball). Geodesy, also called geodetics, is the scientific discipline that deals with the measurement and representation of the Earth, its gravitational field and geodynamic phenomena (polar motion, Earth tides, and crustal motion) in three-dimensional time-varying space. Geodesy is primarily concerned with positioning and the gravity field and geometrical aspects of their temporal variations, although it can also include the study of Earth's magnetic field. Especially in the German speaking world, geodesy is divided into geomensuration ("Erdmessung" or "höhere Geodäsie"), which is concerned with measuring the Earth on a global scale, and surveying ("Ingenieurgeodäsie"), which is concerned with measuring parts of the surface. as the shape of Earth's land surface as it rises above and falls below the sea. As the science of geodesy measured Earth more accurately, the shape of the geoid was first found not to be a perfect sphere but to approximate an oblate spheroid, a specific type of ellipsoid. More recent measurements have measured the geoid to unprecedented accuracy, revealing mass concentrations beneath Earth's surface. ^ Otto E. Neugebauer (1975). A History of Ancient Mathematical Astronomy. Birkhäuser. p. 577. ISBN 978-3-540-06995-9. ^ "The Perfectly Scientific Explanation for Why Chicago Appeared Upside Down in Michigan". ^ "Mirage of Chicago skyline seen from Michigan shoreline". ^ "Easy Globalist Arguments to Refute". ^ "Airliners.net - Aviation Forums". ^ a b Courtney Humphries (28 October 2017). "What does it take to believe the world is flat?". ^ "Richmond, Virginia - Sunrise, sunset, dawn and dusk times for the whole year". ^ "San Francisco, California - Sunrise, sunset, dawn and dusk times for the whole year". ^ ""TOP 10 REASONS Why We Know the Earth is Round" Debunked". ^ "A Date Idea Analyzed". 2009-04-06. ^ Did You Know That the Burj Khalifa Is So Tall That you Can Watch Two Sunsets On the Same Day? ^ "Why B.o.B's Neil de Grasse Tyson Diss Track is Totally Wrong". ^ "The Humber Bridge". Visit Grimsby. Retrieved 17 July 2016. ^ Wright, J. Edward (2002). The Early History of Heaven. Oxford University Press. p. 54. ISBN 9780195348491. ^ Aune, David E. (2003). "Cosmology". Westminster Dictionary of the New Testament and Early Christian Literature. Westminster John Knox Press. p. 119. ISBN 9780664219178. ^ a b Otto E. Neugebauer (1975). A History of Ancient Mathematical Astronomy. Birkhäuser. pp. 575–6. ISBN 978-3-540-06995-9. ^ Friis, Herman Ralph (1967). The Pacific Basin: A History of Its Geographical Exploration. American Geographical Society. p. 19. ^ Huffman, Carl. "Pythagoras". In Zalta, Edward N. Stanford Encyclopedia of Philosophy. ^ Burch, George Bosworth (1954). "The Counter-Earth". Osiris. 11: 267–294. doi:10.1086/368583. JSTOR 301675. ^ Plato. Phaedo. p. 108. ^ The works of Archimedes. Translated by Heath, T. L. Cambridge: Cambridge University Press. 1897. p. 254. Retrieved 13 November 2017. ^ "JSC NES School Measures Up". NASA. 11 April 2006. Retrieved 7 Oct 2010. ^ "The Round Earth". NASA. 12 December 2004. Retrieved 24 January 2008. ^ "When Our Round Earth Was First Measured". The Science Teacher. National Science Teachers Association. 83 (6): 10. ^ Strabo (1960) . The Geography of Strabo, in Eight Volumes. Loeb Classical Library edition, translated by Horace Leonard Jones, A.M., Ph.D. London: William Heinemann. , Vol.I Bk. I para. 20, pp.41, 43. An earlier edition is available online. ^ Klaus Anselm Vogel, "Sphaera terrae – das mittelalterliche Bild der Erde und die kosmographische Revolution," PhD dissertation Georg-August-Universität Göttingen, 1995, p. 19. ^ Ohashi, Yukio (1999). Andersen, Johannes, ed. Highlights of Astronomy, Volume 11B. Springer Science. pp. 719–21. ISBN 978-0-7923-5556-4. ^ Ohashi, Yukio (1993). "Development of Astronomical Observations in Vedic and post-Vedic India". Indian Journal of History of Science. 28 (3): 185–88, 206–19, 240–45. ^ E. At. Schwanbeck (1877). Ancient India as described by Megasthenês and Arrian; being a translation of the fragments of the Indika of Megasthenês collected by Dr. Schwanbeck, and of the first part of the Indika of Arrian. p. 101. ^ a b D. Pingree: "History of Mathematical Astronomy in India", Dictionary of Scientific Biography, Vol. 15 (1978), pp. 533–633 (533, 554f.) "Chapter 6. Cosmology"
^ "Aryabhata I biography". History.mcs.st-andrews.ac.uk. November 2000. Retrieved 2008-11-16. ^ Gongol, William J. (December 14, 2003). "The Aryabhatiya: Foundations of Indian Mathematics". GONGOL.com. Retrieved 2008-11-16. ^ Isidore, Etymologiae, XIV.ii.1 . ^ Referring to Isidore's five circles in De Natura Rerum X 5, ERnest Brehaut wrote: "The explanation of the passage and of the figure which illustrates it seems to be that Isidore accepted the terminology of the spherical earth from Hyginus without taking the time to understand it—if indeed he had the ability to do so—and applied it without compunction to the flat earth." Ernest Brehaut (1912). Encyclopedist of the Flat Earth. p. 30. Similarly, J. Fontaine refers to this passage as a "scientific absurdity". Isidore of Seville (1960). J. Fontaine, ed. Traité de la Nature. p. 16. ^ Wesley M. Stevens, "The Figure of the Earth in Isidore's 'De natura rerum," Isis, 71(1980): 268–277. ^ Faith Wallis, trans., Bede: The Reckoning of Time, (Liverpool: Liverpool Univ. Pr., 2004), pp. lxxxv–lxxxix. ^ Hewsen, Robert H. (1968). "Science in Seventh-Century Armenia: Ananias of Sirak". Isis. 59 (1): 36. JSTOR 227850. ^ "How Islamic inventors changed the world". The Independent. March 11, 2006. ^ Moritz, H. (March 2000). "Geodetic Reference System 1980". Journal of Geodesy. 74 (1): 128–133. Bibcode:2000JGeod..74..128.. doi:10.1007/s001900050278. ^ Behnaz Savizi (2007). "Applicable Problems in History of Mathematics: Practical Examples for the Classroom". Teaching Mathematics and its Applications. Oxford University Press. 26 (1): 45–50. doi:10.1093/teamat/hrl009. Retrieved 2010-02-21. ^ Mercier, Raymond P. (1992). "Geodesy". In J. B. Harley; David Woodward. The History of Cartography: Vol. 2.1, Cartography in the traditional Islamic and South Asian societies. Chicago & London: University of Chicago Press. pp. 182–184. ISBN 978-0-226-31635-2. ^ O'Connor, John J.; Robertson, Edmund F., "Al-Biruni", MacTutor History of Mathematics archive, University of St Andrews . ^ The Sphere of Sacrobosco. trans. Lynn Thorndike. 1949. ^ RK Jain. ICSE Geography IX. Ratna Sagar. p. 7. ^ a b "Jean-Claude Martzloff, "Space and Time in Chinese Texts of Astronomy and of Mathematical Astronomy in the Seventeenth and Eighteenth Centuries", Chinese Science 11 (1993–94): 66–92 (69)" (PDF). Archived from the original (PDF) on 2009-03-05. ^ Needham, Joseph; Wang, Ling. (1995) . Science and Civilization in China: Mathematics and the Sciences of the Heavens and the Earth, vol. 3, reprint edition. Cambridge: Cambridge University Press. ISBN 0-521-05801-5, pp. 220, 498–499. ^ Needham, Joseph; Wang, Ling. (1995) . Science and Civilization in China: Mathematics and the Sciences of the Heavens and the Earth, vol. 3, reprint edition. Cambridge: Cambridge University Press. ISBN 0-521-05801-5, pp. 498. ^ Needham, Joseph; Wang, Ling. (1995) . Science and Civilization in China: Mathematics and the Sciences of the Heavens and the Earth, vol. 3, reprint edition. Cambridge: Cambridge University Press. ISBN 0-521-05801-5, pp. 227, 499. Janice VanCleave (2002). Janice VanCleave's Science Through the Ages. John Wiley & Sons. ISBN 9780471208303. Menon, CPS (2003). Early Astronomy and Cosmology : A Reconstruction of the Earliest Cosmic System, Etc. Whitegishm MT, USA. : Kessinger Publishing. ISBN 9780766131040. Isaac Asimov (1972). How Did We Find Out the Earth is Round?. ISBN 978-0802761217.